Recently, I had the chance to visit UP to meet my friend Miguel. It was then that I was able to breathe the same intellectual ambiance of the campus. I’ve missed everything about it. I even miss the avenue of activism in the campus where students blindly thought that the government was the sole cause of maelstrom of poverty and injustices. 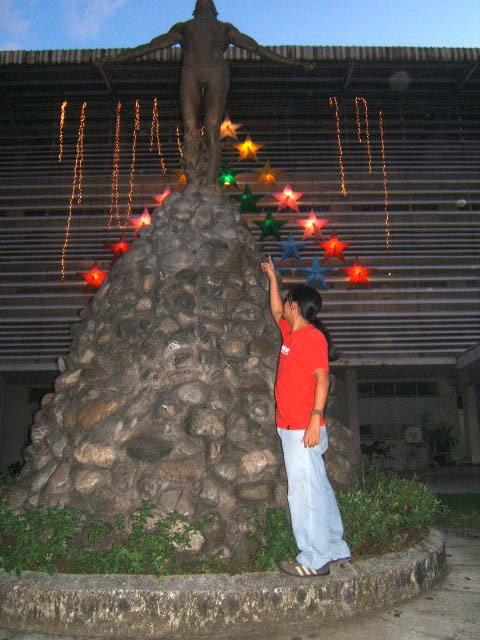 Though I never joined any rallies in Iloilo, I was once an active member of the student activist group in Cebu. I used to join my “comrades” march the length of Mango Avenue to Jones Street whenever a big stir happened in congress or if a scam erupted in the national government. It was a good feeling to voice out what we thought was the sentiments of the masses, and the feeling of solidarity was overwhelming that you could no longer distinguish whether your actions were genuine or mere aping. Fr. Bulatao called this a common consciousness stirred by one definite emotion like in the case of EDSA Revolution. It was a nice feeling but I was fooled, I knew. It was only when I left the group that I began to realize the blunders of activism and the maneuvering of the opposition. My friends were eager to hold me back and brainwashed me to look at the brighter side by insisting that we were doing what others are afraid of – to fight for a change. However the opposite happened. Instead of believing them, I started to loathe them, for it was easy to follow one’s principles than live up to them exactly as stated. And when you have not lived up to it, that would only mean hypocrisy; and I just couldn’t take it. Later on, I discovered what I was fighting for was not the plea of the masses but the perpetuation of some ideologues which I dare not mention. …and back to UP. The government is pouring bigger funds this time for R&D compared to last year’s. This is good news because UP will be one of the recipients of the billions of pesos (pardon me, if I forgot the exact amount). The good thing about this is the potential of the institution to boost academic pressure among the students to delve more in R&D and to set aside the principle of activism for a while. At least, the government will have the reason to curb the growth of foolish belief among students and establish a steadfast cooperation starting from the academe. As you know, when other countries in Asia are scuttling for Science Development, the Philippines still lags in their cause for cultural change and the idea of science as a stratified phase for national development has not been considered seriously but rather regarded as a maudlin fanaticism. Maybe its time that the state university should be careful in selecting students who are willing to commit themselves to national development by studying well and by fostering the importance of research and development as the primary drive for progress. I can say this because I’ve witnessed that many of what we call “iskolar ng bayan” squander the government budget indirectly by cutting and skipping their classes for a shallow reason that passing grade isn’t earned by attendance alone. How many bright students enjoy receiving government subsidy, and instead of returning back what the government has invested for them, they themselves become the forefront of activism and criticize the government for not living up to its promises to alleviate poverty? Are they not part of this huge malfeasance by not attending classes? The government is spending much for them hence they must contribute to what they are supposed to deliver. Ruminating on this, it is sad that some of these students who made it to UP are themselves the best examples of lousiness. No questions with their intellect, but reaping for investment is another story and we always know that there is always the time of reckoning. The government should think twice of the next batch of “iskolar ng bayan” to come in. It may not be the same, but the label “the breeding ground of activism (communism to the extent)” will linger on. As the UP centennial celebration will end soon, many things have been discussed including its century academic excellence that prides its students and its faculties. I have no qualms to say that those bright students chose the right institution, but I am not pretty sure if UP has chosen the right students to nourish. Maybe, it will for the next hundred years. I hope.